The Ashdown Classic Wedding Car Collection, initially contacted NWK Media to help them get their website higher in the search engine rankings. They have a large range of beautiful classic and vintage cars available for hire for weddings and film work, but they were not getting any enquiries as the website was really hard to find in google. We worked out what people were looking for and targeted those keyword phrases. The results were fantastic, for all the agreed keyword phrases. If you looked for "wedding car hire tunbridge wells", "wedding car hire lewes", "wedding car hire uckfield" and "wedding car hire east grinstead", Ashdown Wedding Cars were ranked No.1! The only problem was, the enquiries were still not coming in. The cars are amazing, but the original site design did not do them justice. So we embarked on a site makeover. The transformation has been remarkable. People's preception of Ashdown Wedding Cars has totally changed. The photos of the cars now take centre stage. First impressions count and this does apply to your website. It's great that people can find your website, but if they don't like what they see, you might as well not bother. 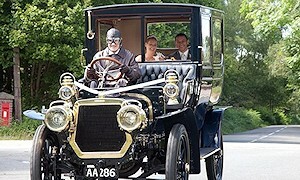 Take a look at the website: Ashdown Wedding Cars.